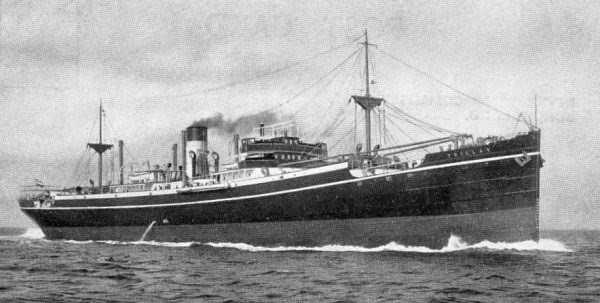 S.S. Triglav underway. The water spouting out of the starboard side is salt water used to cool the machinery. The Yugoslav ensign is visible on the transom, as is a lifeboat and two derrick masts. A gangway appears to be laid out on the starboard side between the funnel and bridge, suggesting the ship has just left or is about to call on a port. The Yugoslavian steam ship Triglav was built in 1929 by William Doxford & Sons Limited of Sunderland, northeast England. Yard number 572, the ship was completed in August. She was 6,363 gross registered tons and could carry 10,760 deadweight tons of cargo. Her length overall was 440.2 feet, with a beam of 58.2 feet and a draft of 26.5 feet. A single triple-expansion steam engine developed 573 net horsepower and propelled the steel ship at 10 knots. The engine was manufactured by John Dickinson and Sons, also in Sunderland. Triglav’s owners were Jugoslavenski Lloyd Ackionarsko Drustvo of Zagreb, Yugoslavia and she was registered to the port of Dubrovnik in that country. The main trades of this line were between Yugoslavia and Argentinian and Uruguayan ports on the southeast coast of South America as well as passenger vessels to Israel, Greece and Egypt in the summer. On October 23rd 1941 the ship sailed from New York Harbour. Aside from that there is little record of her wartime activities between 1939 and July 1942 as she appears to have participated in no convoys. In officers and crew of the Triglav were of mixed nationality, including British, Canadian and Danish among others. There were a total of 43 persons on board including gunners for the cannons. In June of 1942 the ship sailed from Lourenço Marques, Portuguese East Africa, in what is now Mozambique. She loaded a part cargo of 9,000 tons of manganese ore and zinc concentrates and then sailed to Lobito in Angola (then a Portuguese colony in West Africa). The ship sailed from Lobito on the 19th of June, 1942, bound for New York to discharge. On Thursday the ninth of July the Triglav was in a position 915 nautical miles southeast of Bermuda and 945 nautical miles northeast of Antigua, in the Caribbean and 2,230 nautical miles to Gibraltar at the mouth of the Mediterranean Sea. At that point the unsuspecting vessel sailed across the sights of the German submarine U-66 under the command of Kapitänleutnant Friedrich Markworth. 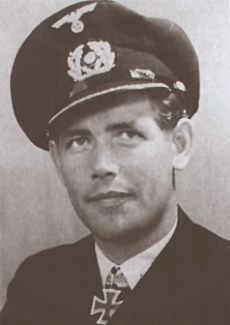 Kapitänleutnant Friedrich Markworth, commander of U-66 which sank the S.S. Triglav on 9 July 1942. Markworth’s lookouts first spotted the Triglav as a mere smoke cloud on the horizon. The time was 2:10 pm German time, which was roughly 9 am local, or ship’s time and daylight. The men on U-66 observed that the Triglav was steering northwest on a general course of 306 degrees, consistent with her destination of New York, and was not zig zagging defensively. Markworth noted in his KTB or war day book that “Steamer has no neutrality markings, flies no flag, gray with brown bridge, on the stern a 7.5 cm cannon.” In fact there was a gun crew manning the cannon. Markworth lined up for an attack, estimating the ship’s speed at 8.2 knots. He took U-66 down to have a better look at the ship. He noted “Steamer is suspicious in spite of straight course because he is on course for New York.” At 8 pm German time his men went to action stations. The breeze was a light 10 knots or so, visibility was good, and the seas were only slight. Markworth fired two torpedoes from Tube One and Tube Two from over 3,300 feet. The first projectile hit forward of the mast and cargo derrick, and the second one hit just at the after mast. Then at 8:42 pm the submariners, accustomed to hearing noises underwater, heard what they considered to be a boiler exploding. Ten minutes later, at 8:52 German time, the Triglav sank. Markworth surfaced and took U-66 amongst the two lifeboats, one with 19 men in it and the other with 22 survivors – one crew member and a gunner were killed in the attack. From the Triglav’s captain Markworth noted in his log the following: “’TRIGLAV’, 6363 GRT from Lobito for New York with manganese ore among other things. Captain believed U-boat risk first north of 30°N, therefore straight course.” By this he means that the captain told him that he felt the danger of being sunk by a U-boat began at 30 degrees north, and since they were only at 26 degrees 47 minutes north, and not yet at 30 degrees, he did not think it necessary to zig zag the Triglav evasively. 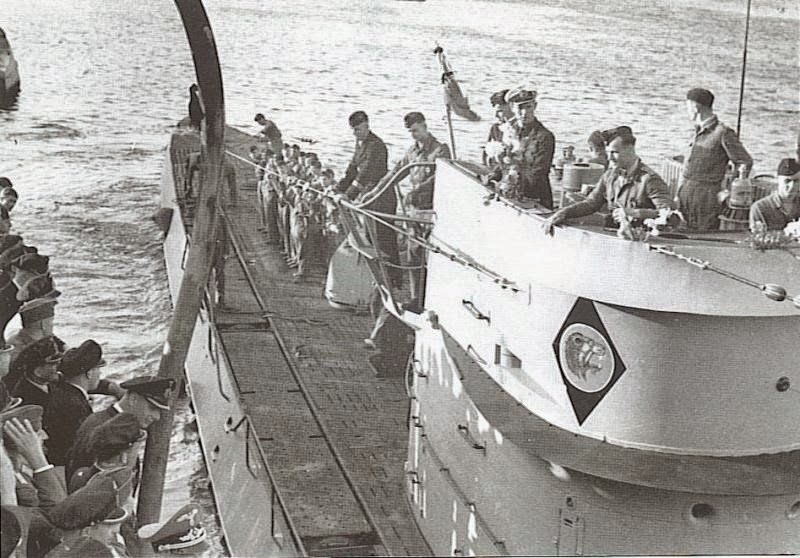 U-66 leaving Lorient, according to the caption in 1944 under the command of Richard Zapp. The insignia is clearly visible on the conning tower. At 9:45 the U-66 shaped a course of 270 degrees west for half an hour, before changing course to 200 degrees southwest and the coast of South America. By 11:05 pm the lifeboats were “out of sight bearing 70 degrees True.” Only one of the lifeboats, the one with fewer occupants, would ever be seen again. The missing boat was last sighted steering for the southwest. Among those who perished were DEMS (Defensively Armed Merchant Ships) Gunner Roderick Roy Dewar, Royal Canadian Naval Reserve, aged 22, British Fireman Philip Maurice, aged 23, and Danish Steward Olaf Alf Karloff, aged 19. On or about Friday the 17thof July, after a lifeboat voyage lasting roughly eight days, the 19 survivors in the Triglav’s lifeboat were rescued by the Spanish steams ship Iciar. With a speed of just under ten knots the ship would have covered the distance to Gibraltar in about ten to eleven days. It arrived in that British protectorate on Tuesday the 28th of July. The S.S. Iciar was 4,584 gross registered tons and owned by the Compania Naviera Guipuzcoana of Bilboa and San Sebastian, Spain. Built in 1922, the ship could carry 6,750 deadweight tons of cargo, was 377 feet long and 40.6 feet deep with a draft of 23.3 feet. She was capable of ten knots. During the Spanish Civil War she was intercepted in June of 1937 with a cargo of weapons including 32 cannon, 750 machine guns and other military equipment. The Iciar had an interesting wartime career. On July 5th 1939 the US Chief of Naval Operations and the US Naval Attache in Cuidad Trujillo (now Santo Domingo), Dominican Republic, that the Iciar was carrying US currency from Lisbon Portugal – an activity which was illegal at the time. The funds were impounded and the ship allowed to sail (fold.3). On a voyage from Scotland to Spain in April 1942, British paramilitaries in the S.S. Parracombe secretively renamed their ship the Iciar temporarily to avoid detection until they sailed from Cadiz to the Balearic Islands in the Mediterranean. (“Last Voyage of S.S. Parracombe,” p. 452). The neutral Iciar survived the war and in 1960 was sold to the Compania Islena Maritima. In December 1963 it stranded on the breakwater of Viscaya, Spain and became a total loss. 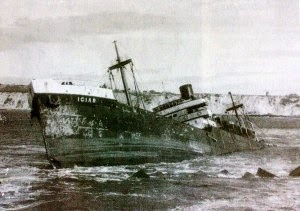 The Iciar in its final throes, aground on the breakwater in the port of Santurce, or Viscaya, Spain on the 29thof December 1963. It was destroyed by the sea in a matter of days. U-66 was a highly successful U-boat, with thirty-three ships sunk worth an astounding 200,021 GRT plus another two damaged for 22,674 and two warships damaged for sixty-four tons. She would be sunk west of the Cape Verde Island by depth-charges, ramming and gunfire from aircraft flying off the USS Block Island and the US destroyer USS Buckley on 6 May, 1944 – thirty-six of her crew survived.